Well, by now you all know how much I love Thai food and this recipe just continues to fuel my love for the cuisine. The time stamp on the recipe might look like it takes a long time, but it’s a lot of inactive cooking and just hanging around which makes it an ideal dish for a dinner party. Not only can it feed a crowd, but because it doesn’t require much work, it leaves you free to mingle and sip on a cocktail. A nice large piece of pork is slowly roasted until tender and then you crank the heat up while basting the outside with a flavorful sauce of coconut milk, kaffir lime, thai chili, brown sugar and fish sauce which creates a crust as the pork cooks and leaves the inside tender and moist. You could serve the pork with any color of curry sauce you prefer (I love them all), I just chose green because I hadn’t used it in a bit. The brine is super important in this recipe because it flavors the pork all the way through, so try and brine overnight, if possible. This was one of the tastiest recipes I’ve made recently and I hope you enjoy it as much as I did. Happy cooking! To make the brine: dissolve the sugar and salt in the hot water. Add the remaining ingredients and the cold water to cool the brine down. Place pork into a large ziplock bag and pour the brine over the pork so that it's covered with liquid. Seal the bag and place into a baking dish (just in case there is a leak) and refrigerate overnight or, at the very least, 6 hours. To make the pork: Preheat an oven to 325 degrees F. Remove the pork from the brine, brushing off any peppercorns or leaves. Set the pork on a wire rack over a rimmed baking sheet lined with foil. Roast for 2.5-3 hours, until the pork is mostly tender. Increase the heat to 450. In the carafe of a blender, blend all the basting ingredients until smooth. While the pork roasts at a higher temp, baste the pork with the sauce every 5-10 minutes for about 40 minutes. The sauce will create a crust on the outside. To make the curry: In a heavy bottomed pot, heat the oil over medium heat. Add the curry paste, lemongrass and lime leaves and cook, stirring, until the curry paste is fragrant. Add the coconut milk and bring to a gentle simmer. Add the palm or brown sugar and stir until dissolved. Simmer for about 15 minutes, until the sauce has thickened. Add in the onion, bamboo shoots and eggplant. For extra flavor, you can sauté the eggplant until browned before adding it to the sauce. Season to taste with salt and pepper. Remove the pork from the oven and transfer to a serving bowl. 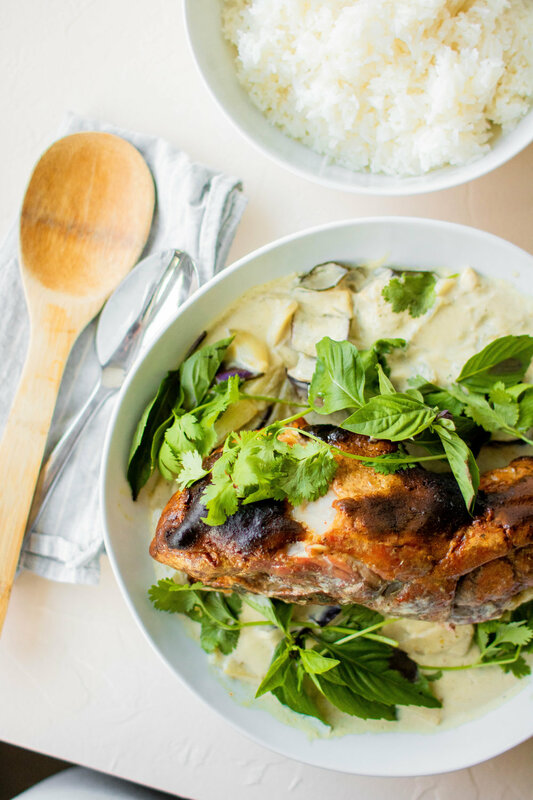 Ladle the sauce and veggies around the pork and garnish with thai basil and cilantro. Serve with rice.